US Virgin Islands : When and where to go? You will find warm temperatures, between 20 ° C and 30 ° C throughout the year, with a wetter climate between April and August because of a few frequent but very brief showers. From July to October, there is a risk of hurricane, but you will be warned early enough to take shelter. If you want to avoid the influx of tourists, avoid the December to March period which corresponds to the high season. The island of St. Thomas has many natural attractions, although its capital Charlotte-Amalie highlights the trade and luxury hotels. Go to the top of Drake's Seat for a magnificent view. The most beautiful beaches are on the north coast, such as Magens Bay (very popular), Coki Beach or Saphire Beach. You can also visit the galleries of the Tillet Gardens Art Center offering contemporary works. The island of St. John is the wildest, and the national park occupies two-thirds of its surface: you can go hiking on more than twenty paths throughout the island, with or without guide . Two sites not to be missed: the former sugar plantation of Annaberg, and Bordeaux Mountain, which dominates the whole island. The national park also includes 3,000 hectares of seabed, with an underwater route marked out at Trunk Bay, which will allow you to discover corals and marine flora. 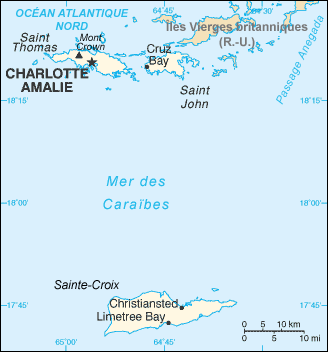 Sainte-Croix Island is dotted with the ruins of ancient homes where the owners of plantations resided, in the austere landscapes of the east, while to the west there is a steeper relief and lush vegetation. It is surrounded by a coral reef, and offers beautiful secluded beaches such as Caneel Bay, Great Pond or Coaklay. From Sainte-Croix, you can also visit the uninhabited island of Buck Island, a protected area with a superb beach and a sublime seabed to explore with a snorkel. From its colonial past, you will discover the church and the Christiansted fortress. Also worth seeing is the Whim Greathouse Museum, which tells the story of slave life in the early 19th century, and the botanical garden of St-George Village with its 1,500 varieties of plants. Sports to practice: hiking, diving, surfing, sailing. European citizens need only a valid passport, and a visa is only required for a stay of more than 90 days. You will land at St. Thomas International Airport, a few miles from the capital, or at Alexander-Hamilton Airport on St. Croix. There are ferries between St-Thomas and St-John, and from St-Thomas to Ste-Croix there is a plane, a seaplane and a hydrofoil ship. On land, public buses run between the main cities, but are slow and infrequent: it is better to choose private buses, or taxis, or even rent a car or a scooter. Budget: a higher budget will be needed than in the other Caribbean islands, but you can get by without renting a villa rather than staying at the hotel. Count at least 50 € per night and per person. Health: No vaccine is required. During your dives, avoid touching the coral to avoid cuts that may quickly become infected. Protect yourself effectively against the sun and mosquitoes. Safety: Simply take the usual precautions, ie avoid isolated areas after dark, and do not leave valuables in evidence, especially in the capital Charlotte-Amalie. Shopping: There are many duty-free items such as jewelery, liqueurs, cigars and cigarettes, cosmetics, and handicrafts made on site.